Crystal River Cruises has announced Ms Elisabeth Gürtler as the Godmother of its first river ship, Crystal Mozart. On 11th July, the re-imagined “Queen of Europe’s Rivers” will be officially welcomed to the fleet in Vienna in a christening ceremony that will culminate when the ship’s newly announced godmother breaks the customary champagne against the bow. Ms Gürtler is no stranger to the finer nuances of luxury travel, as the managing director of Vienna’s most famous hotel, the Hotel Sacher. Her expertise on Vienna and its cultural wonders stretches to the city’s historic Spanish Riding School, where she is also acting director. As godmother of Crystal Mozart, Gürtler joins an esteemed group of Crystal matriarchs that have come before, including Mary Tyler Moore (Crystal Harmony), Dame Angela Lansbury (Crystal Symphony), Dame Julie Andrews (Crystal Serenity) and Lady Gaenor Meakes (Crystal Esprit). 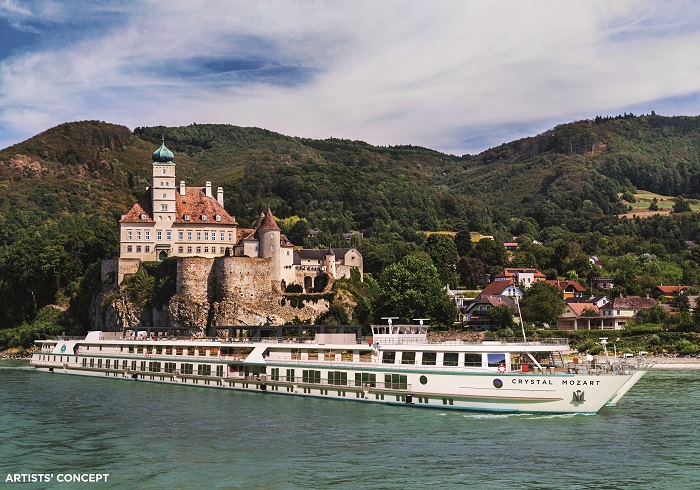 Crystal Mozart will embark on her maiden voyage round-trip from Vienna on 13th July, calling in picturesque locations lining Europe’s second-largest river. Visits to Dürnstein, Melk and Linz, Austria; an overnight in Passau, Germany; Bratislava, Slovakia; a second overnight in Budapest, Hungary; and ending with two nights back in Vienna will afford Crystal’s world-savvy guests intimate, immersive exploration of the region. As the ‘World’s Most Luxurious Travel and Lifestyle’ portfolio continues to expand, Crystal will welcome six newly built additional river yachts to its luxury fleet over the next three years. The sleek vessels will cruise rivers in France, Eastern Europe and the surrounding regions.